The Uganda Netball team in a group photograph. The team has already secured two victories in the Africa Netball Championship. Courtesy photo. 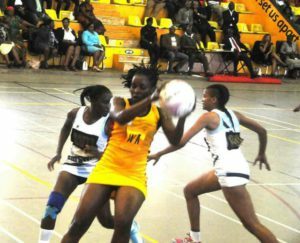 With two wins from the opening two fixtures at the Africa Netball Championship, hosts Uganda are in the driving seat at the six-team tournament. Despite the impressive start that includes the 69-31 and 72-29 wins over Namibia and Botswana, coach Vincent Kiwanuka believes the victories will be of little importance should the She Cranes fail to defeat Malawi on Monday. “They are our biggest threat without doubt,” Kiwanuka said after Sunday’s victory over Namibia. “We just need to avoid complacency. I saw a bit of that today and if we play again like that, we could be punished,” Kiwanuka added. 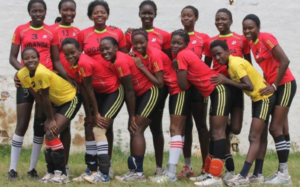 The She Cranes improved in the latter stages of their game against Namibia after a slow start which they led 15-11 before going into the fourth quarter with a 56-24 goal lead. Loughborough Lightning shooter Peace Proscovia and goal attacker Rachael Nayongo scored 42 and 17 goals respectively before being replaced at the end of the third quarter. A She Cranes player in action during one of the games. Courtesy photo. The Malawi Queens, sixth in the world, are the highest ranked team at the tournament with Uganda 13th. The hosts, however, prevailed past their more established opponents defeating them 67-34 and 52-39 in two warm up games. Malawi will rely on Manchester Thunder shooter Joyce Mvuls who joined the team on Friday and helped defeat Zimbabwe 55-45 in their opening game on Sunday. Botswana and Zambia.The latter led 33-31 towards the end of the third quarter with the remainder of the game set to be played first.